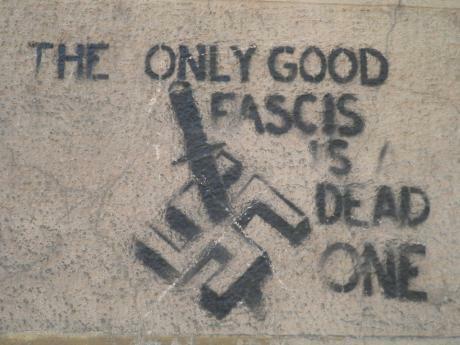 The far-right continues to grow in Greece but so to does the antifascist response. The last few weeks alone have seen antifascist actions across the country. Over the last six months and more if you checked the news from Greece in the morning it’s likely you would see a report of another attack or incident involving far-right groups. Whilst sadly this is still the case recently it’s become just as likely that there will be a report of another antifascist action to brighten up the morning. This has especially been the case the last few days. In the last days alone there has been a motorcycle patrol of hundreds through Athens, a Golden Dawn(GD,a far-right political party) office was attacked in Northern Greece as riots against the opening of another office took place in the West. Amidst all this an annual march to commemorate the fall of a nationalist military dictatorship drew tens of thousands at the weekend. Thursday evening saw the fifth antifascist motorcycle patrol through Athens. This was probably the biggest of the patrols so far with hundreds of people riding through the centre of the city. A previous patrol at the end of September led to clashes with fascists and the police. 15 antifascists were arrested, tortured(interview here) and charged €3,000 each for bail(the total of €45,000 has now been raised). Despite this repression the patrols continued with the most recent one being the biggest so far. This tactic of forming motorcades to protect areas which have seen fascist activity has spread beyond Athens with similar protests in the northern towns of Kavala and Volos. Since its election to parliament in June GD has been opening offices across the country. Whenever a GD office opens it frequently becomes the target of attack. In different corners of Greece this was the case again last weekend. In Xanthi, northern Greece, a GD office was attacked whilst riots broke out as protesters attempted to reach another office in Agrinio, western Greece. The GD office in Agrinio was protected by GD members and the police leading to clashes and the use of tear gas in the small town. The office in Xanthi was not protected and so was smashed and vandalised. In Athens and throughout Greece the 17th November is a day of protest and commemoration each year. 17th November 1973 saw what is called the Polytechnic uprising when protesters who had occupied the Polytechnic university in central Athens were crushed by the military. However the protests began the fall of the dictatorship of the colonels. The colonels, a nationalist military junta which ruled Greece from 1967-74, are often looked at favourable by the far-right and Golden Dawn. Each year tens of thousands of people join the demonstrations and celebrate the end of the nationalist junta. This year was the same despite the police ordered closure of most of the metro stations in central Athens and a huge presence of around 6,000 officers on the streets. So as new struggles take place previous battles are not forgotten. This coming Saturday(24th) will see another antifascist demonstration in Athens. For the last months almost every day there has been an antifascist/anti-racist action or demonstration somewhere in Greece. Almost every neighbourhood of Athens has seen demonstrations or actions against Golden Dawn and fascism in the last few months and it’s not unusual for there to be demonstrations of hundreds or thousands going on in two or three neighbourhoods at the same time. The rise of fascism and the far-right in Greece is continuing and likely will continue. Attacks on immigrants or anyone opposed to fascism and nationalism take place all the time. The trend continues inside the parliament as Golden Dawn pushes arrests for blasphemy while the right wing New Democracy government borrows ideas from them such as tightening up citizenship laws to the determinant of many immigrants. But now there is growing evidence of a response from society. All across Greece antifascist actions are taking place all the time. The far-right may be on the rise but it is not unopposed. Posted on November 23, 2012, in Europe and tagged Antifascism, Greece. Bookmark the permalink. Leave a comment.